The political uncertainty in Germany is weighing on EUR. There are no major economic reports in Eurozone. The support rests at 1.13790 with resistance at 1.14740 which the weekly pivot point at 1.14310 is located in between the lines. The EMA of 10 is moving with bearish bias in the descendant channel and it is below the EMA of 200 and the EMA of 100. The RSI is rising towards the 50 level, the Stochastic is moving in high ranges and the MACD line is above the signal line in the positive territory. The ADX is showing weak buy signal. Despite the indicators signals, the resistance zone seems to be too strong to be broken. 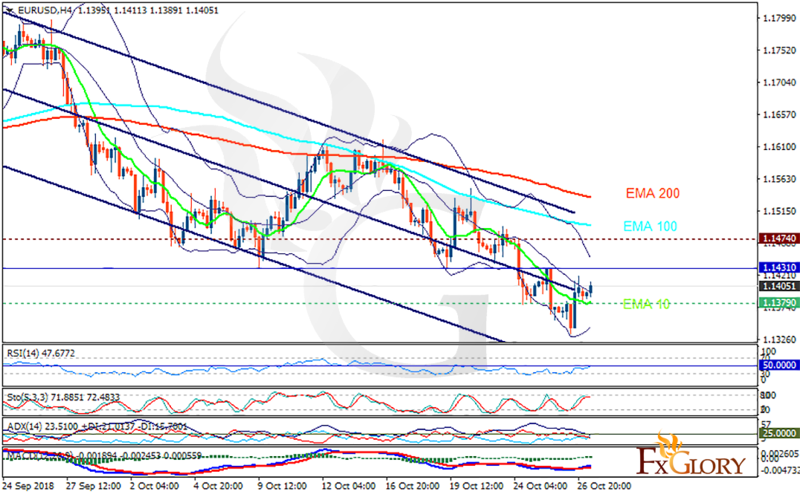 Most probably EURUSD will continue its bearish trend towards the lower Bollinger band at 1.134.